Overweight Americans who blame fast food restaurants for causing their obesity won't get their day in court if the U.S. House of Representatives gets its way. 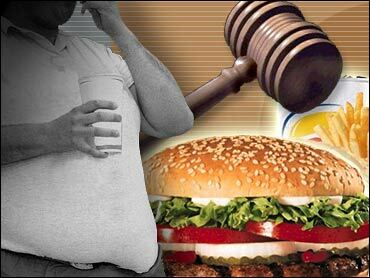 House lawmakers on Wednesday passed a bill banning obesity-related lawsuits against restaurants and food manufacturers. More than 20 states already have such laws on the books. Supporters said the bill was intended to prioritize personal responsibility among an increasingly obese American population. "The bill seeks to block lawsuits by people because they ate too much and got fat," says Rep. Chris Cannon, R-Utah, one of the bill's sponsors. "We should not encourage lawsuits that blame others for our own choices and could bankrupt an entire industry," notes Rep. Lamar Smith, R-Texas. Still, there is little evidence that obesity lawsuits are threatening the food and restaurant industry. Only a handful of cases blaming restaurant food or advertising for obesity have ever been filed, and only one major case remains open. That's a case first filed in 2002 alleging that misleading advertising by McDonald's restaurants influenced New York teenagers to eat too much of the food and become obese. If Wednesday's bill — which passed 306 to 120 — becomes law, the suit will be thrown out of court and all future suits would be banned. Nearly two-thirds of American adults are classified as overweight and about 30% are obese, according to the CDC. Fifteen percent of children aged 6 to 11 are also classified as overweight. Critics charged that courts have already functioned properly by dismissing obesity cases they found frivolous and that the bill was giving special rights to restaurants and food manufacturers. "Congress is headed in the wrong direction with this bill, which removes any and all incentives for the food industry to improve" the healthiness of their products," says Rep. Bob Filner, D-Calif. The Food Products Association, an industry group headed by former Republican Congressman Cal Dooley, praised the vote in a statement that called the bill "timely and needed." Wednesday's vote was the second time the House passed the lawsuit ban. An identical bill passed in March 2004 but was never acted upon in the Senate. The same fate could await this year's bill, as Senate Republican leaders have suggested that their docket before a scheduled pre-Thanksgiving recess is already jammed. SOURCES: Rep. Chris Cannon (R-Utah.). Rep. Lamar Smith (R-Texas). Rep. Bob Filner (D-Calif.). CDC. Food Products Association. © 2005 WebMD, LLC.. All Rights Reserved.